For Windows 8 users, and of those that use Skype, you’ll find an update in the Store today for Microsoft’s new messaging platform since retiring Microsoft Messenger, bumping Skype for Windows 8 to version to 1.6. This revision brings the normal performance tweaks, but most notably brings the ability to block contacts. You’re now presented with the option to remove or report any user you do not wish to hear from. With this update, we wanted to give our users higher control over who can contact them by adding the ability to block contacts. To block a contact, select the person’s name to open up the chat window. Bring up the command bar by swiping at the top or bottom of your screen (or right click), and select block. You may also choose whether you want to remove or report the contact request as spam. While many updates tout ‘performance tweaks’ it seems Skype for Windows 8 actually has improved noticeably The speed and reliability seems to have improved greatly when loading contacts, as well as a number of bugs fixed such as the one where Skype would display the wrong call error message when a call failed, or where it was not possible to switch between calls on hold. 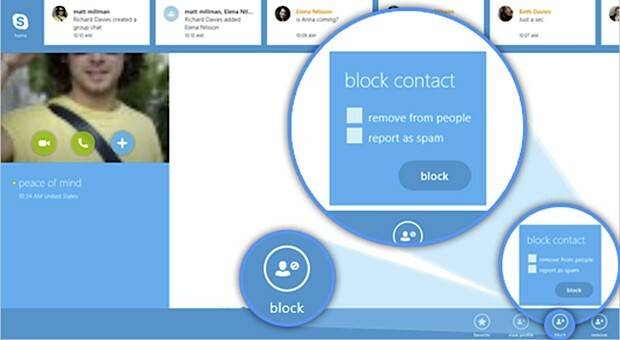 Skype mentions there is still a known bug present in this release, where in some cases when Skype for Windows 8 is in the background, you may not be able to answer a call. Despite these improvements in version 1.6, Skype is still not the same as the desktop version, with some functionality differing greatly between Skype for the desktop and Skype for Windows 8. While you can just install the regular Skype desktop version in Windows 8 by downloading the .exe from the Skype website, rather than by visiting the Windows Store (which makes the version fragmentation even more odd), Skype for Windows 8 utilises the Metro design and does look good, albeit with reduced functionality. The update is available in the Windows Store now, so go ahead and hit update.